quick fix quick fix You can detect malware using Reimage. Why do they call it Reimage Express virus? 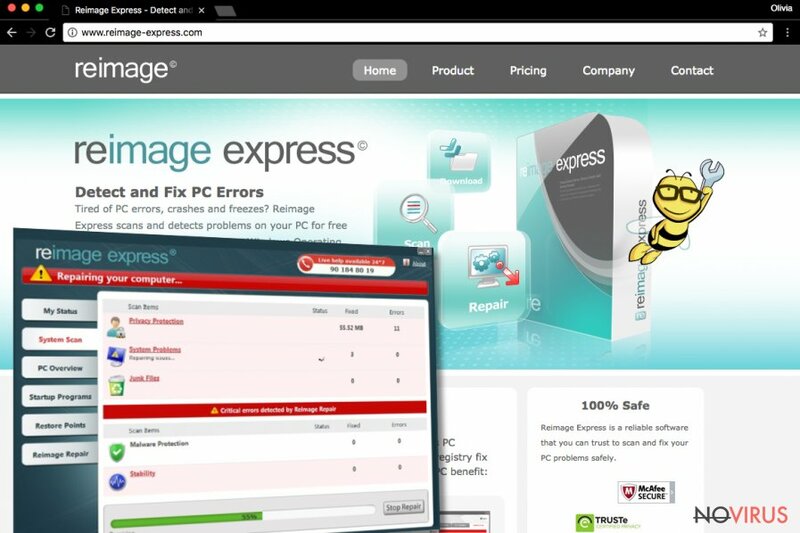 Is Reimage Express worth using? For the past year, we have received many questions related to so-called Reimage Express virus. We want to emphasize that it is not a virus. It is a legitimate security program that you can download from the official website. The program is created for protecting Windows OS, fixing computer-related problems and removing viruses. It is a free version of Reimage – a strong and reputable anti-malware program that we always recommend for malware removal. The problem is that computer users complain that this program appeared on their computers out of the blue and started delivering pop-up message ‘Reimage Express found 120 problems in your PC. You can fix these errors using Reimage Express.’ Usually, these kinds of notifications are the sign that user’s computer is infected with a virus, and we always recommend uninstalling computer infection immediately, but not in this case. 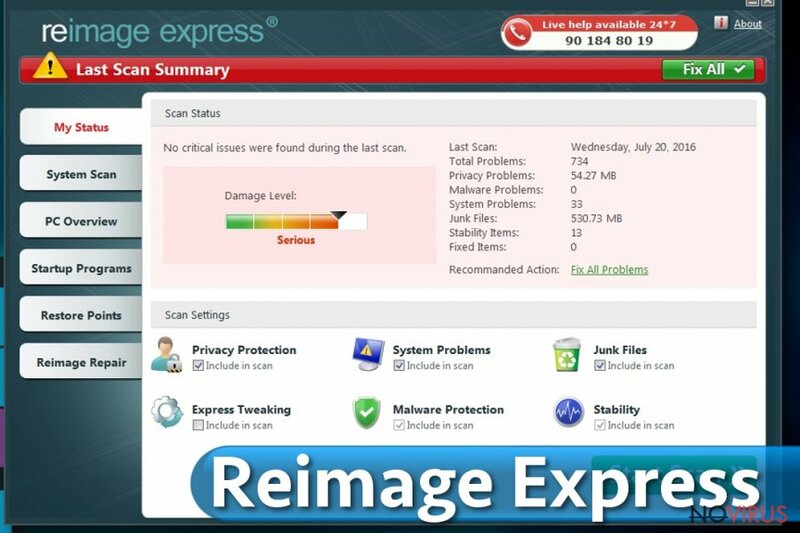 As we already told you, Reimage Express is not a virus, and it cannot damage the computer. The problem is that many computer users install it accidently. Even though Reimage Express has an official website, it might also get inside PC as an optional program during regular software installation. For this reason, users decide that program is malicious. It is not wise to accuse all optional programs of being dangerous if users do not pay proper attention to software installation. Indeed, many potentially unwanted programs might be bundled with software, but it’s your responsibility to monitor installation process by using ‘Advanced’ or ‘Custom’ installation mode. Many programs developers use this software distribution technique, and if you choose ‘Basic’ or ‘Quick’ installation, they will be installed on your PC. Installer does not adequately disclose about additional programs – that’s why you have to find and decline their installation. 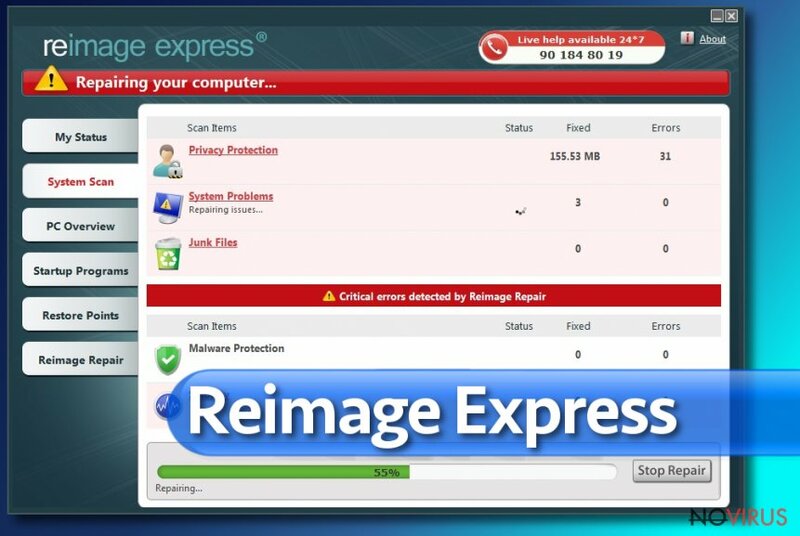 If you already made this mistake and you want to remove Reimage Express from your PC, you can uninstall it from Control Panel just like any other program. As we already explained, it is reliable and useful tool for keeping computer safe from the majority of PC infections and fixing various errors. However, it is a free version, so it provides only minimal protections and can fix the only limited amount of computer issues. Once you install a program, it starts scanning computer’s system and looks for malicious files, errors and other computer-related issues. Then it delivers a notification with a number of detected errors and offers to repair these problems. The number might vary from few to hundreds of issues. If you care about your computer’s well-being, you should accept this offer. PC might be hiding malicious or potentially unwanted programs that might affect computer’s speed and performance. However, you should bear in mind that for eliminating and fixing serious computer-related problems, you should buy a full version. If this program appeared out of the blue or you are not satisfied with its performance, you can simply uninstall it manually. Even though people call it Reimage Express virus, this program is not malicious. We recommend upgrading it and use Reimage for everyday protection. However, if you decided to get rid of the program, you can simply uninstall it like any other software. Besides, we want to remind you that it is important to use security tools to protect your computer from potentially unwanted programs, malware, and viruses. Click on the Start menu and go to Control Panel. There choose Uninstall a Program or Add/Remove Programs. In the list look for Reimage Express. Click on it, select Uninstall and then OK. This post was published on 2019-04-02 at 10:13. Category: System tools, Viruses. A list of Viruses associated with Reimage Express. You can quickly scan the QR code with your mobile device and have Reimage Express manual removal instructions right in your pocket. What method did you use to remove Reimage Express?